What a treat I saw the other day when visiting an office outside of town. Here sitting nicely next to the espresso coffee machine was a little plastic container with a sign requesting spent coffee cakes. The post-loved coffee is then used in the garden where it belongs! So what is that, an old icecream container – a simple way to save such a valuable resource. Would it be easy to setup the same thing in your office? 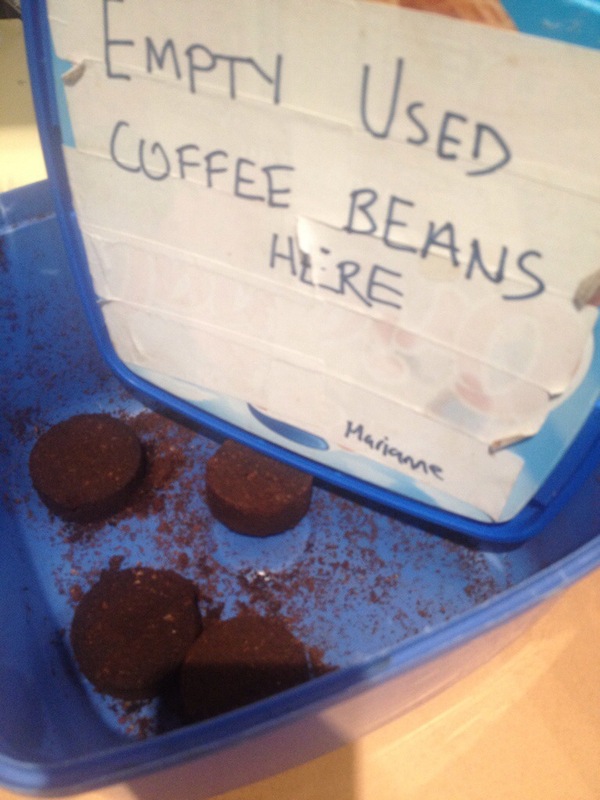 Tags: coffee grounds, collecting coffee, puck. Bookmark the permalink. Previous post ← Another Writer Joins Ground to Ground – Rebekah Smith Makes Three! Think cleaners for collecting coffee grounds from large offices. My son works at a large hospital. Cleaners (unacknowledged heroes that they are) fill large plastic bags with coffee grounds for staff to collect. Seems there are no shortage of takers. I scored 8 bags (each weighing about 10kg) last week. Some goes into a worm bin and some into hot compost piles. Unfortunately, I alerted my wife to using coffee grounds for her precious roses. Now there is increased competition. I can only hope the cleaners can keep up their good work. My plant recycle all it’s coffee waste, about 4 tons a week.